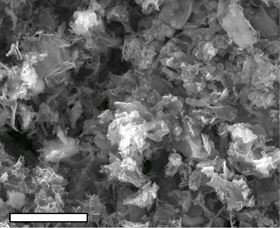 A scanning electron microscope image showing cobalt-infused metal oxide-laser induced graphene. Image: Tour Group/Rice University. Rice University chemists who developed a unique form of graphene have found a way to embed metallic nanoparticles into it, turning the material into a useful catalyst for fuel cells and other applications. Laser-induced graphene, created by the Rice lab of chemist James Tour last year, is a flexible film with a surface of porous graphene made by exposing a common plastic known as polyimide to a commercial laser-scribing beam. The researchers have now found a way to enhance the product with reactive metals. The research appears this month in the journal ACS Nano. With this discovery, the material that the researchers call ‘metal oxide-laser induced graphene’ (MO-LIG) becomes a new candidate to replace expensive metals like platinum in catalytic fuel cell applications, whereby oxygen and hydrogen are converted to water and electricity. "The wonderful thing about this process is that we can use commercial polymers, with simple inexpensive metal salts added," Tour said. "We then subject them to the commercial laser scriber, which generates metal nanoparticles embedded in graphene. So much of the chemistry is done by the laser, which generates graphene in the open air at room temperature. "These composites, which have less than 1% metal, respond as 'super catalysts' for fuel-cell applications. Other methods to do this take far more steps and require expensive metals and expensive carbon precursors." Initially, the researchers made laser-induced graphene with commercially available polyimide sheets. Later, by infusing liquid polyimide with boron, they produced laser-induced graphene with a greatly increased capacity to store an electrical charge, making it an effective supercapacitor. For this latest iteration, they mixed liquid polyimide with one of three concentrations containing cobalt, iron or molybdenum metal salts. After condensing each mixture into a film, they treated the film with an infrared laser and then heated it in argon gas for half an hour at 750°C. That process produced robust MO-LIGs containing metallic, 10nm particles spread evenly through the graphene. Tests demonstrated the ability of these materials to catalyze oxygen reduction, an essential chemical reaction in fuel cells. Further doping of the material with sulfur allowed for hydrogen evolution, another catalytic process that converts water into hydrogen, Tour said. "Remarkably, simple treatment of the graphene-molybdenum oxides with sulfur, which converted the metal oxides to metal sulfides, afforded a hydrogen evolution reaction catalyst, underscoring the broad utility of this approach," he said. A pulsed-laser process can improve the electrical conductivity of inkjet-printed graphene without damaging the surfaces on which it is printed. Scientists have used a laser to turn the surface of pine wood into a form of graphene, potentially offering a way to produce biodegradable electronics.